here we go - let's try out some artsy hazelnut decorations! first off, toast and peel your hazelnuts! fun fact: in grocery stores (superstore for sure), hazelnuts are called filberts! why you ask? apparently because they resemble full beards, where the word filbert comes from. to toast... simply stick them on a baking pan in the oven at 350 degrees for about 10 minutes! then roll them around in a dry cloth to peel. 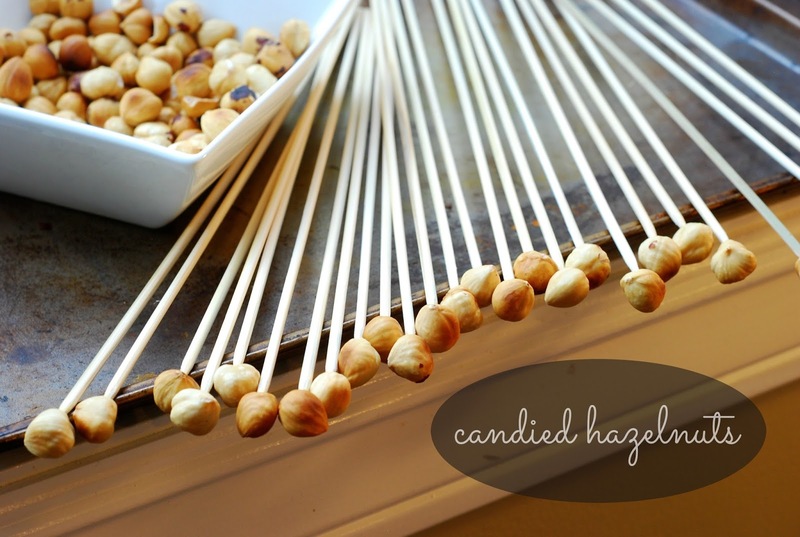 grab a bunch of skewers and gently twist the ends into the hazelnuts. once you've got that ready, it's time to make some caramelized sugar! for me, this was the hardest part. then start dipping your hazelnut skewers into the sugar. a brilliant idea i read from another blog is to secure the skewers on the countertop over an opened dishwasher. that way the dishwasher can pick up the mess and wash it out when you run it. place the candied hazelnut on your dessert, and there you have it! i placed them on my mini nutella-banana crepe cakes. click on the link above, or picture below to see that recipe! They look adorable! So creative!